For the anti-violence campaign launched by BTS and UNICEF, see Love Myself (campaign). "Love Myself" is the debut single by American actress and singer Hailee Steinfeld. It was released on August 7, 2015, through Republic Records and Universal Music Group, as the lead single from her debut extended play (EP), Haiz (2015). The song was written by Mattias Larsson, Robin Fredriksson, Oscar Holter, Julia Michaels, and Justin Tranter, with the production being handled by Holter, with Larsson and Fredriksson under their stage name Mattman & Robin. It is also included on the soundtrack to the 2015 film, Jem and the Holograms. The song's lyrics include "I'm gonna put my body first/And love me so hard 'til it hurts" and "I'm gonna touch the pain away/I know how to scream my own name"; the music video, released one week later, features Steinfeld wearing a leotard emblazoned with "self service". This prompted many fans and media outlets to dub the song an "ode to masturbation". Steinfeld said the lyrics are intended to be interpreted by the listener, "but for me it's an empowerment record and it’s ultimately about taking care of yourself and indulging yourself, whether that be emotionally or physically or with material things." According to musicnotes.com, the song is written in G minor, and has a tempo of 120 beats per minute. The accompanying music video, directed by Hannah Lux Davis, was released on August 14, 2015. The video shows Steinfeld dancing through Los Angeles with several other people. ^ a b "Love Myself - Single by Hailee Steinfeld on iTunes". iTunes Store (US). Archived from the original on October 1, 2015. Retrieved September 9, 2016. ^ "Love Myself - Hailee Steinfeld - Songs, Reviews, Credits - AllMusic". AllMusic. Retrieved September 9, 2016. ^ Hampp, Andrew (June 6, 2015). "'Pitch Perfect' Star Hailee Steinfeld on Her Debut Album and Starring in 'Bad Blood' - Billboard". Billboard. Prometheus Global Media. Retrieved September 9, 2016. ^ Russell, Erica (October 17, 2015). "Hilary Duff Joins Jem And The Holograms On Film Soundtrack". PopCrush. Retrieved September 9, 2016. ^ Weatherby, Taylor (August 7, 2015). "Hailee Steinfeld Debuts "Love Myself", Self-Empowering First Single". Billboard. Retrieved August 16, 2015. Russell, Erica (August 15, 2015). "Hailee Steinfeld Spreads the Love In New Video for "Love Myself"". POPCRUSH. Retrieved August 16, 2015. ^ Hardeep Phull (August 13, 2015). "Hailee Steinfeld sings an ode to masturbation". New York Daily News. Retrieved September 12, 2015. ^ Alyssa Norwin (August 14, 2015). "Hailee Steinfeld's 'Love Myself' About Masturbating? — Fans Freak Out On Twitter". Hollywood Life. Retrieved September 12, 2015. ^ Steve Huff (August 23, 2015). "Actress Hailee Steinfeld's Masturbation Anthem Tickles Our Ears". Maxim. Retrieved September 12, 2015. ^ Robinson, Peter (August 25, 2015). "Hailee Steinfeld interview: "I wasn't prepared for it to happen this quickly"". Popjustice. Retrieved August 28, 2015. ^ Jessica Goodman. "Hailee Steinfeld is totally empowered in new 'Love Myself' music video". Entertainment Weekly. Retrieved September 1, 2015. ^ Morris, Jessie (August 14, 2015). "Here's Hailee Steinfeld's New Video For "Love Myself"". Complex.com. Retrieved September 5, 2015. ^ "Love Myself". Qobuz. Retrieved 29 February 2016. ^ Ryan, Gavin (October 17, 2015). "ARIA Singles: Macklemore & Ryan Lewis 'Downtown' Spends Another Week at No 1". Noise11. Retrieved October 17, 2015. ^ "Ultratop.be – Hailee Steinfeld – Love Myself" (in Dutch). Ultratip. Retrieved September 9, 2016. ^ "Ultratop.be – Hailee Steinfeld – Love Myself" (in French). Ultratip. Retrieved September 9, 2016. ^ "Hailee Steinfeld Chart History (Canadian Hot 100)". Billboard. Retrieved September 8, 2016. ^ "Hailee Steinfeld Chart History (Canada AC)". Billboard. Retrieved September 8, 2016. ^ "Hailee Steinfeld Chart History (Canada CHR/Top 40)". Billboard. Retrieved September 8, 2016. ^ "Hailee Steinfeld Chart History (Canada Hot AC)". Billboard. Retrieved September 8, 2016. ^ "ČNS IFPI" (in Czech). Hitparáda – Radio Top 100 Oficiální. IFPI Czech Republic. Note: Change the chart to CZ – RADIO – TOP 100 and insert 201549 into search. Retrieved September 9, 2016. ^ "ČNS IFPI" (in Czech). Hitparáda – Digital Top 100 Oficiální. IFPI Czech Republic. Note: Change the chart to CZ – SINGLES DIGITAL – TOP 100 and insert 201541 into search. Retrieved September 9, 2016. ^ "Danishcharts.com – Hailee Steinfeld – Love Myself". Tracklisten. Retrieved September 9, 2016. ^ "Chart Track: Week 4, 2016". Irish Singles Chart. Retrieved January 30, 2016. ^ "מדיה פורסט - לדעת שאתה באוויר". Mediaforest.biz. Archived from the original on November 4, 2015. Retrieved October 31, 2015. ^ "Italiancharts.com – Hailee Steinfeld – Love Myself". Top Digital Download. Retrieved September 8, 2016. ^ "Hailee Steinfeld Chart History (Japan Hot 100)". Billboard. Retrieved September 8, 2016. ^ "Nederlandse Top 40 – Hailee Steinfeld" (in Dutch). Dutch Top 40. Retrieved September 9, 2016. ^ "Dutchcharts.nl – Hailee Steinfeld – Love Myself" (in Dutch). Single Top 100. Retrieved September 9, 2016. ^ "Charts.nz – Hailee Steinfeld – Love Myself". Top 40 Singles. Retrieved September 8, 2016. ^ "Norwegiancharts.com – Hailee Steinfeld – Love Myself". VG-lista. Retrieved September 8, 2016. ^ "ČNS IFPI" (in Slovak). Hitparáda – Radio Top 100 Oficiálna. IFPI Czech Republic. Note: insert 201544 into search. Retrieved September 9, 2016. ^ "ČNS IFPI" (in Slovak). Hitparáda – Singles Digital Top 100 Oficiálna. IFPI Czech Republic. Note: Select SINGLES DIGITAL - TOP 100 and insert 201541 into search. Retrieved September 9, 2016. ^ "Swedishcharts.com – Hailee Steinfeld – Love Myself". Singles Top 100. Retrieved September 8, 2016. ^ "Swisscharts.com – Hailee Steinfeld – Love Myself". Swiss Singles Chart. Retrieved September 8, 2016. ^ "Chart Log UK: New Entries Update" (19.09.2015 / week 38). zobbel.de. ^ "Hailee Steinfeld Chart History (Hot 100)". Billboard. Retrieved September 8, 2016. ^ "Hailee Steinfeld Chart History (Adult Pop Songs)". Billboard. Retrieved September 8, 2016. ^ "Hailee Steinfeld Chart History (Dance Club Songs)". Billboard. Retrieved September 8, 2016. ^ "Hailee Steinfeld Chart History (Dance Mix/Show Airplay)". Billboard. Retrieved September 8, 2016. ^ "Hailee Steinfeld Chart History (Pop Songs)". Billboard. Retrieved September 8, 2016. ^ "Canadian single certifications – Hailee Steinfeld – Love Myself". Music Canada. Retrieved February 16, 2016. ^ "Danish single certifications – Hailee Steinfeld – Love Myself". IFPI Denmark. Retrieved September 8, 2016. Scroll through the page-list below to obtain certification. ^ "Italian single certifications – Hailee Steinfeld – Love Myself" (in Italian). Federazione Industria Musicale Italiana. Retrieved March 13, 2017. Select "2017" in the "Anno" drop-down menu. Select "Love Myself" in the "Filtra" field. Select "Singoli online" under "Sezione". 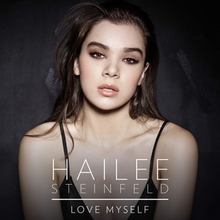 ^ "New Zealand single certifications – Hailee Steinfeld – Love Myself". Recorded Music NZ. Retrieved September 8, 2016. ^ "Guld- och Platinacertifikat" (in Swedish). IFPI Sweden. Retrieved September 8, 2016. Type Hailee Steinfeld in the top right search bar. Click on "Sok" and select "Visa" under Love Myself to see certification. ^ "British single certifications – Hailee Steinfeld – Love Myself". British Phonographic Industry. Retrieved January 19, 2018. Select singles in the Format field. Select Silver in the Certification field. Type Love Myself in the "Search BPI Awards" field and then press Enter. ^ "American single certifications – Hailee Steinfeld – Love Myself". Recording Industry Association of America. Retrieved June 7, 2018. If necessary, click Advanced, then click Format, then select Single, then click SEARCH.